An Arduino compatible stepper motor driver shield. This shield makes use of 2x Allegro A3969 microstepping driver ICs allowing the shield to drive up to two stepper motors independently. The motors can be connected to the shield via screw terminals, or if fitted, via the 4 pin JST connectors. Separate motor power can be supplied via the 2.1mm jack socket or via the shields Vin pin. The shield also includes headers for controlling up to 4 standard servos. An on-board 3.3V/5V logic selection switch provides compatibility with 3.3 and 5V Arduinos. Motor supply voltage (Vin) should be less than or equal to the coil voltage of your stepper motor. Motor supply voltage (Vin) is directly connected the Vin pin of your Arduino, therefore it should not exceed the maximum supply voltage of the Arduino (normally 12V). 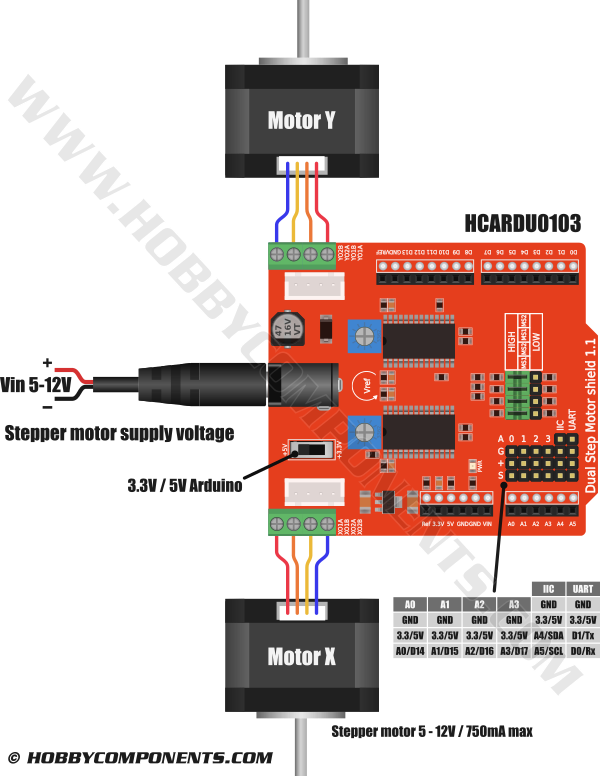 Servo outputs A0 & A1 are not available if motor Y is in use and servo outputs A2 & A3 are not available if motor X is in use. IIC is only compatible with Arduino Uno. motors connected to the motor X & Y output terminals of the shield. A beautifully made product, but one word of warning. If this is used on the hobby components Arduino, there is a potential for the usb shorting out the underneath of the motor driver shield. I've yet to find a permanent solution, other than to make extenders to the Arduino connectors. Maybe glue a mica washer to the usb socket, although it is right on the edge of some pins on the motor board. If anyone else has ideas I would like to hear. If I recall correctly I think it's the pins of the white socket that are quite close to the USB socket, is this what you are referring to? However I believe they should sit off to the side of the USB socket and just missing it by about 1 to 2mm. It is pretty close so I guess if the headers of the shield or the Arduino where slightly bent to one side it could touch the USB socket. Unfortunately we are currently out of stock of these shields so I can't check this but I'll take a look as soon as we get new stock. They are incredibly close, however that doesn't detract from their usefulness though. I have hooked mine up to an Arduino uno programmed with the provided sketch. Using two of your nema 17 motors, which have the correct plugs to connect straight to the board. The issue I'm having is that with 12v plugged into the motor board everything works for so long, ie the motors ramp up and down in speed, and then reverse. I have noticed that the driver chips get incredibly hot after ten or so seconds, and then one or both motors run erratically. I cannot tell if the potentiometer connected to each chip makes a difference or not. Do you have any advice regarding the pots, and the heat, apart from maybe heatsinks/fans? The issue I'm having is that with 12v plugged into the motor board everything works for so long, ie the motors ramp up and down in speed, and then reverse. I have noticed that the driver chips get incredibly hot after ten or so seconds, and then one or both motors run erratically. This sounds like the thermal protection is kicking in and shutting down the driver circuit. As a general rule with all electronics is if a component gets too hot to touch then it is probably being overloaded. I.e. too much current is flowing through it. I cannot tell if the potentiometer connected to each chip makes a difference or not. I've taken a look at the schematic (we still don't have any in stock so I can't check what's actually fitted to the board) and according to it the boards have a 0R resistor fitted for the sense resistor. Checking the datasheet this would imply that the driver will not limit the current though the motor(s). If this is the case the only things I can suggest would be either to replace the sens resistors (R3 & R7) with a larger value or to significantly reduce the supply voltage (Vin) to your motors. hi Andrew, thank you for that. I will try tomorrow and let you know.